Easy Prep Themed Cross Curricular Centers & Activities for Lower Elementary Children! Baseball Literature List: Choose books from the list about baseball to read to your students. 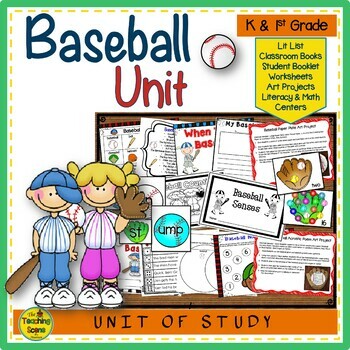 Baseball Writing Station Words: Print and laminate a few colored copies of the Baseball Writing Station words for students to use or copy one sheet for each student to put in their writing folder or journal. “To Play Baseball” Classroom Book: Copy cover on cardstock and then copy the student sheet for each student and have them write about what they need to play baseball. Collect each student paper and make classroom book binding or stapling book together. 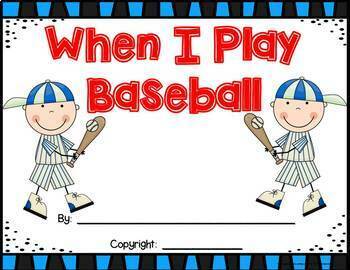 “When I Play Baseball Classroom Book: Copy cover on cardstock and then copy the student sheet for each student and have them write what they do when they play baseball. Collect each student paper and make classroom book binding or stapling book together. 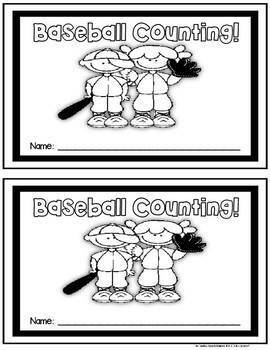 Baseball Counting Student Booklet: Students can work on this booklet at center or quiet work time to practice their number and color words. Students copy over the number and color word and then color the baseball pictures the correct color. You can copy the pages on regular paper, there are two booklet pages to each sheet with one cover and 10 other pages.. Baseball Senses Booklet: Copy and assemble each of the “ BaseballSenses” booklets for each students . There are two booklet pages to each sheet with one cover and 6 other pages.. You can copy as many pages as you would like students to do. Students fill in the blank of each baseball senses statement and then draw a picture of what they wrote. Story Elements Graphic Organizers (2 types): After reading a story from the literature list a few times, have students fill out the story elements: characters, setting, problem & ending., either by drawing or writing out with words. Beginning, Middle and Ending Organizer: (2 types): After reading a story a few times, have students fill out the story parts organizer, naming the beginning, middle and ending of the story. Sequencing Retelling Graphic Organizers (2types): After reading a story from the literature list a few times have students fill out the sequence story retelling. Students must sequence the events in the story in order. Baseball Nonfiction Organizers: After reading a factual book about baseball students fill out this nonfiction organizer with 3 facts they have learned about Baseball Students must include a topic and concluding sentences about Baseball At the bottom of the sheet students write out their facts and conclusion into sentences to make a paragraph. This paragraph can be typed up to make a classroom book or a student display. Baseball & Football Venn Diagram: Students compare and contrast the Baseball & Football This can be done as a whole group or will older students in a center or during worktime. My Baseball Story: Students write a story about baseball using the story sheets provided. Baseball Paper Plate Art Project: Copy and assemble the baseball following the directions and template page in unit. Hang the baseballs in the hallway or in the classroom for decorations. Glove & Baseball Acrostic Poem Art Project : Copy and assemble glove & baseball acrostic poem using the directions and template page in unit. Display gloves & baseballs in hallway or in the classroom for decorations. Baseball Beginning Sound Capital & Lowercase Letter Match: Matching Game: Children match the pictures with the beginning sound capital & lowercase letter. Memory Game: Either use both letter cards or one letter card and the sound cards. Children can play this by placing the cards face down in rows. They take turns turning two cards over to see if the letter and sound match. If it does they keep both cards, if not they turn the cards back over and the next child has a turn. The person who has the most matches wins the game. Challenge: Memory game using all three cards in set to find and match. Letter & Sound Mat: Children can use these mats to help organize there letters and sound cards. Good resource for students who are just learning the letters and sounds or for those students who need visual aids. Picture List: List of pictures included in resource. Baseball Make a Word Game: Children take a glove (consonant & consonant blends are provided) and put it in front of a baseball word chunk to make a word. Children can write word on paper or white board or use one of the 14 worksheets to go with this activity. Baseball Short Vowel Sounds Roll It! Read It! Words & Sentences: Two types of game cards with short vowel sounds words and sentences. There is a game card of words and sentences for each of the short vowel sounds. There are 10 game cards in total. Students roll one dice and read the words or sentences in the row they have rolled. 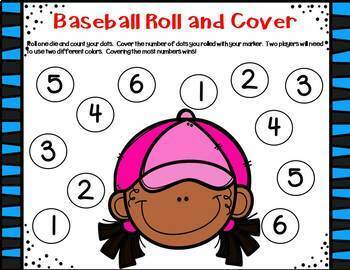 Baseball & Gloves Number & Number Word Match Game: Children place the number baseball counters to match the number word or numeral on the baseball glove number card. Number Words cards are 0-10, Numeral cards are 0-20. Baseball Roll & Cover: One or Two Dice Roll : Roll One or two die and count your dots. Cover the number of dots you rolled with your marker. Two players will need to use two different colors. Covering the most numbers wins! Baseball Addition & Subtraction Facts Clip Game (0-10): Children read the addition number sentence and find the sum or differences of the two numbers. Children place a paper clip or clothes pin to the correct answer of the number sentence. You can separate the game cards in sets from 0-5 and a sets from 6-10. Note: Put a little sticker on the back of card in the correct answer space so students can self-correct their answers. Kids have some baseball fun while learning a variety of skills!